At Light of Dance you can find Show Acts that you will never forget it. With a fantastic performance and a sensational Choreographie we show you what it is like to watch pure magic. LED Show Ballet Light of Dance its got nothing to do with a classic ballet, with the help from our LED Lighting technoogy and beautifull coustumes we can show you a perfect event just like our LED Subject-Dance. With our performance all eyes are on our dancers which are breathtaking and they are making sure that you will not forget about it. The LED Lighter its making our performance even more better and making sure that you can see everything from every angle. Our performance its followed by our amazing music which you can enjoy every minute in it. The LED Subject-Dance its giving you a lightthing show, that the spectators will be thrilled. 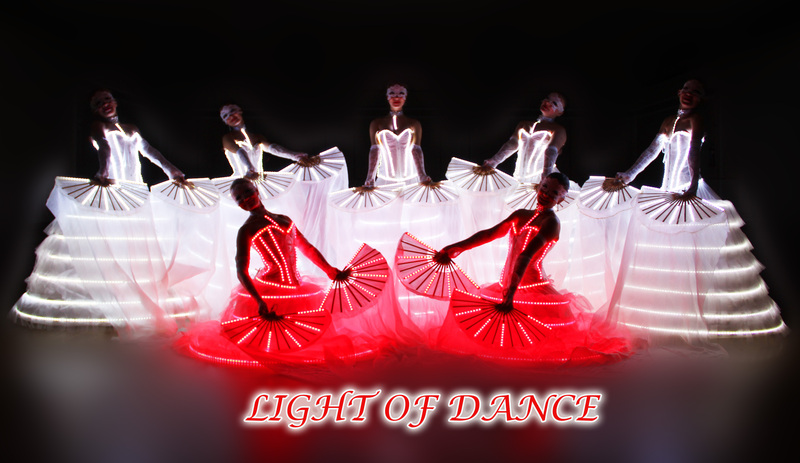 The LED Subject-Dance its magical and it can not be missing on your event or gala night. Dont waste any time and get in touch with us.